Parents say they are having a hard time getting the meds. BAKERSFIELD, Calif. — UPDATE: An Auvi-Q representative has responded to 23ABC and says "There is no shortage of AUVI-Q, nor has there been. Patients can obtain the device via direct delivery service through the Auvi-q.com website or at Walgreens stores." A local Walgreens pharmacy says they do have a few in stock, but not too many as of today. Local parents with children with severe allergies may being running into a problem at pharmacies. Many people rely on EpiPens as the first line of defense for a severe allergic reaction. 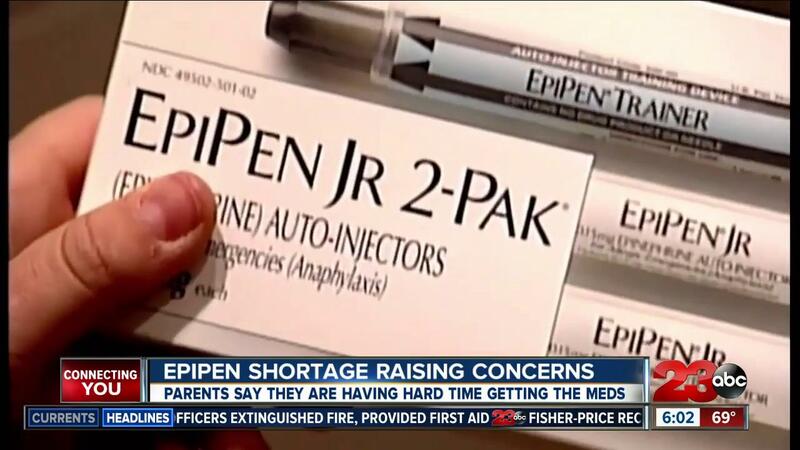 Several pharmacies tell 23ABC today, they do not have any EpiPens or generic brands in stock for their patients and some say they have had a shortage for the past year. Angela Chavez, mother of three, and healthcare professional is no stranger to questioning the pharmaceutical companies. She says the shortage of EpiPens and similar brands is no different. “If that’s not available for my kids or for other children at my home it’s a concern for me,” said Chavez. Chavez, along with the Lee Clinical Pharmacy, are asking the same question: Why aren’t the four brands such as EpiPen, EpiPen Jr., Auvi-Q, and the authorized generic brand from Mylan available? “I am wondering why they aren't available and why the price has gone up so much—especially as a mother why isn't it available for the children that need them,” said Chavez. Dianna Lee, pharmacist at Lee Clinical Pharmacy, says she has customers who are still waiting for any kid of auto injectors of epinephrine. “I asked probably a year ago why there are such a shortage and they say it's just a manufacturing problem and that’s all they would tell me,” said Lee. Lee says other surrounding pharmacies call and ask if she has any in stock, and she can't get more than one at a time-- including both pediatric and adult versions. “There is no alternative unless you use the little amphipods but there is not enough in that dose to really help anybody,” Lee added. If these auto injectors are in stock Lee explained the price can be too high, ranging from about $150 to $3,000 and they are not always covered by insurance. Last year, the Food and Drug Administration extended the expiration date of some brands due to shortages. One local allergist I spoke to shared one alternative is to always have medications, like Benadryl on hand. Also, be sure to ask your doctor what the best immediate medication is. Mylan has established a customer service number, to help pharmacies and patients locate EpiPens if necessary, for more information on that follow this link.